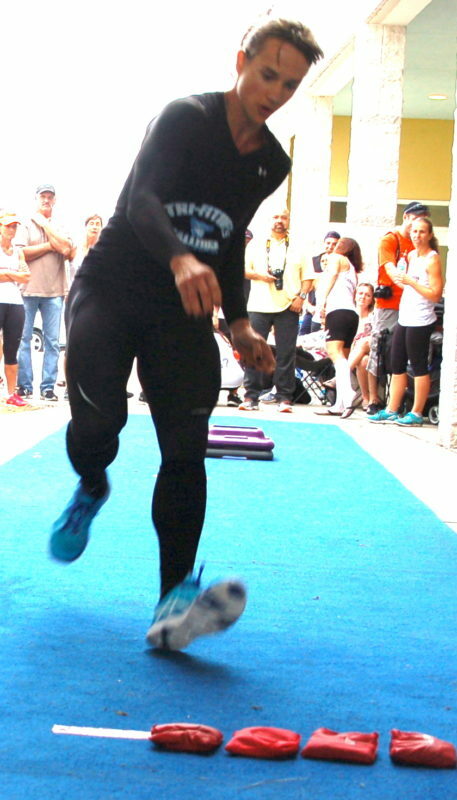 See why Dwayne “The Rock” Johnson calls Tri-Fitness the ULTIMATE FITNESS CHALLENGE! SET GO! ** Over the past 17 years, Tri-Fitness has provided opportunites to their athletes to appear in and grace the cover of magazines such as Natural Muscle, Oxygen Magazine, Ironman Magazine, etc. as well as become WWE (World Wrestling Entertainment) stars, appear on television shows such as Guinness World Records Gone Wild, Ninja Warrior, American Gladiator, Fear Factor, HBO Real Sports, etc. ** Tri-Fitness was created so athletes can compete and challenge themselves on a level playing field. It is an event where challenging oneself and meeting new friends is more important then a trophy. 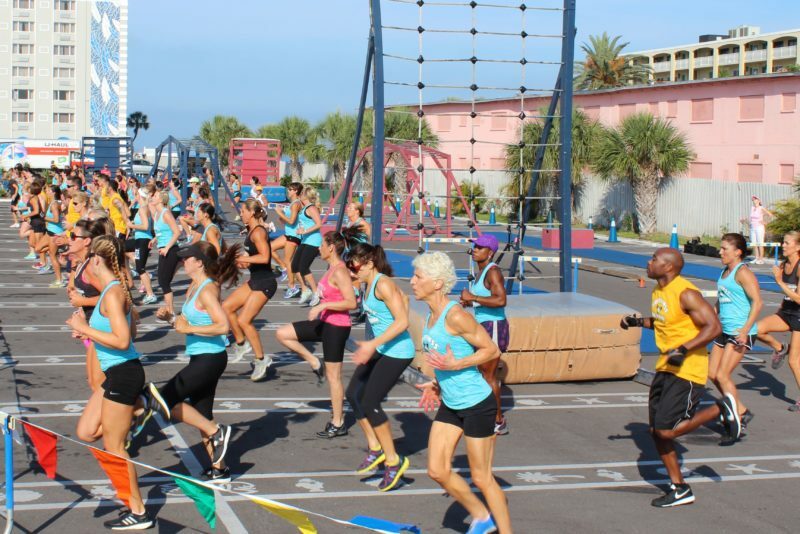 We welcome anyone and their family to come join us June 27-28 at the Grand Hyatt in Tampa for the 17th Tri-Fitness World Challenge; Bring your children as we have a Children’s Shutte Run (Free for athletes and spectators children). Registration includes professional photos taken by professional photographers of each of the events. Tri-Fitness is a sporting event with a foundation based on the dedication to health, fitness and the competitive spirit. In 1997, Al Rosen decided to create a sporting event to empower athletes and have them feel the power of accomplishment. Rosen (a gym owner for 28 years, physical education teacher and coach, former professional wrestler, fitness trainer) with a background in gymnastics used the gymnastic formula to create the scoring (10 point system). 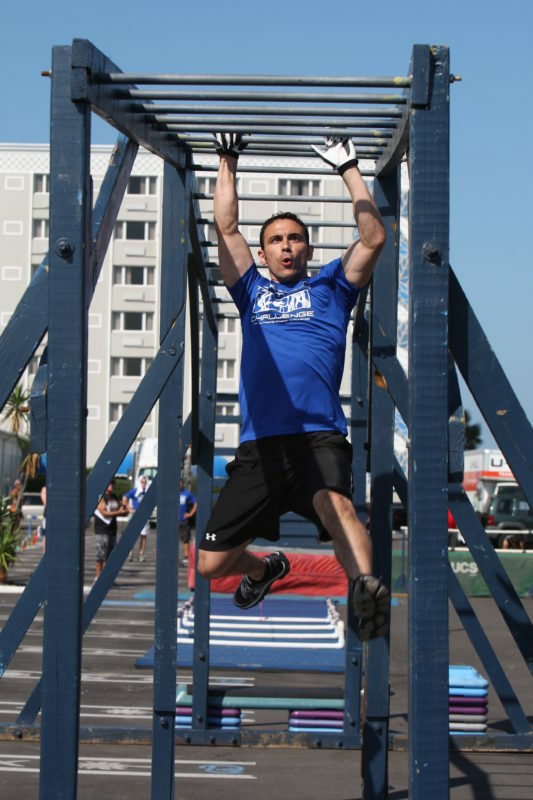 Rosen states: “instead of bars, beam, vault and floor the Tri-Fitness has obstacle course, fitness skills, fitness routine and true grit challenge as well as a Grace & Physique event for women (the physique is a by-product of the type of training and nutrition one does preparing for the event).” In past television interviews, Rosen has been known to explain how amazing it is to see women looking like Barbie in the Grace & Physique turn into G.I . Jane on the obstacle course. An athlete can compete in ANY or ALL of the events listed below. Awards are presented for age group and overall in each event and in combination of events: Tri-Fitness (Obstacle Course, Fitness Skills, True Grit); Tri-Fitness Optional (all events in Tri-Fitness plus Grace & Physique); Overall Tri-Fitness (all events in Tri-Fitness plus Grace & Physique and Fitness Routine). 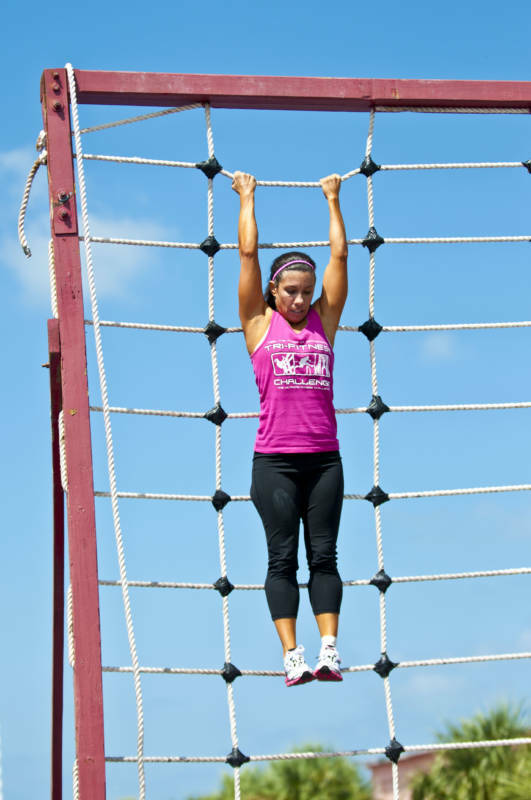 Obstacle Course Cargo net 15 feet – no problem! 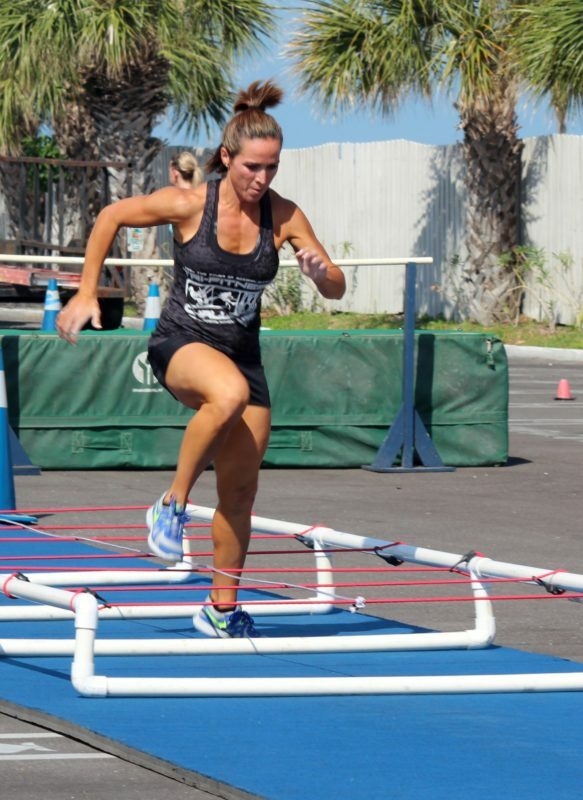 The obstacle course has never changed thus you will always be able to challenge yourself to a PR (personal record) each time you run the course. 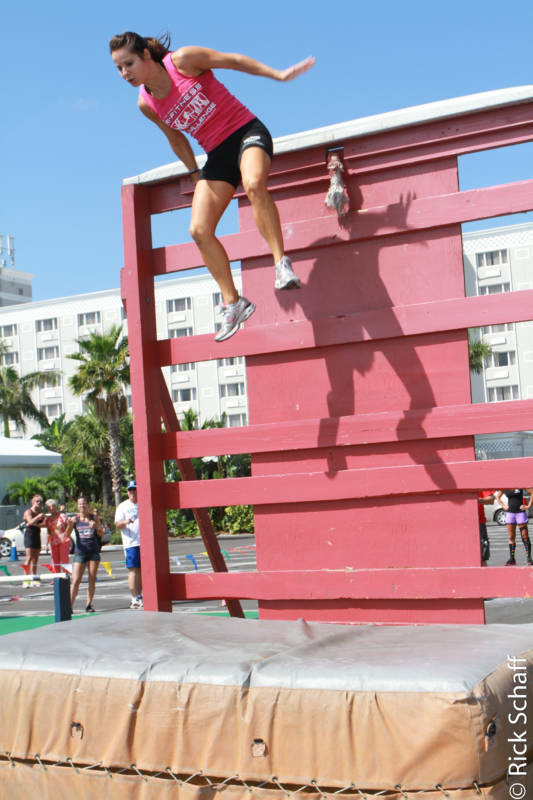 The course is 160 yards and has the following elements: 10 foot wall, 15 foot running grid, incline/decline monkey bars, balance beam, 15 foot cargo net, baton shuttle run, (3) hurdles, steeple chase jump, under bar, and over bar. Don’t worry if you are struggling, the Tri-Fitness volunteers and coaches are always there to support and spot you! You will feel the energy as everyone cheers everyone on. In the past, the executive producer of HBO Real Sports reported it is the only sport she has witnessed where fellowe competitors cheer on other athletes. The Fitness Skills are made up of 3 elements: 1) Box Jumps; 2) Bench Press; 3) Shuttle Run. This is a timed event where the athlete will perform 50 jumps on a 20 inch box (there is a 2 inch cheer floor in front of the box thus making the jump 18 inches. The athlete will be timed in the jumps or step up (when stepping, the feet must simultaneously hit the top of the box). Any part of your foot can hit the box (thus it might only be the athletes toes). Any athlete under 45 years old must jump 20 before stepping or there is a 1 second penalty for each one not jumped. Plyometric jumps Tri-Fitness box jumps- 50 as fast as you can! Tri-Fitness Bench Press- 60% body weight (women) 80% men- as many reps as you can! Women bench 60% of their bodyweight and Men bench 80% – rounded to the closest 5 lbs. The only rules are the bar pad (use a squat pad on the olympic bar) must touch the chest and the arms must extend. There is no penalty for bounching, arching, feet off the floor, etc. A rest in the upward position can not exceed past 10 seconds and a rest in the bottom position can not exceed 5 seconds and the hands can not open. Tri-Fitness Shuttle run- set go! 3) Shuttle Run – This is a timed event where the athlete will do a 10 bean bag, 20 foot shuttle run placing each bean bag in a double riser. If the athlete misses a bean bag, the bean bag must be picked up or attempted to be picked up the following time. The foot must cross a 4 foot line near the riser before the bean bag is released. The 3 Fitness Skills will be put in a formula based on the 10 point system thus creating a Fitness Skills score. 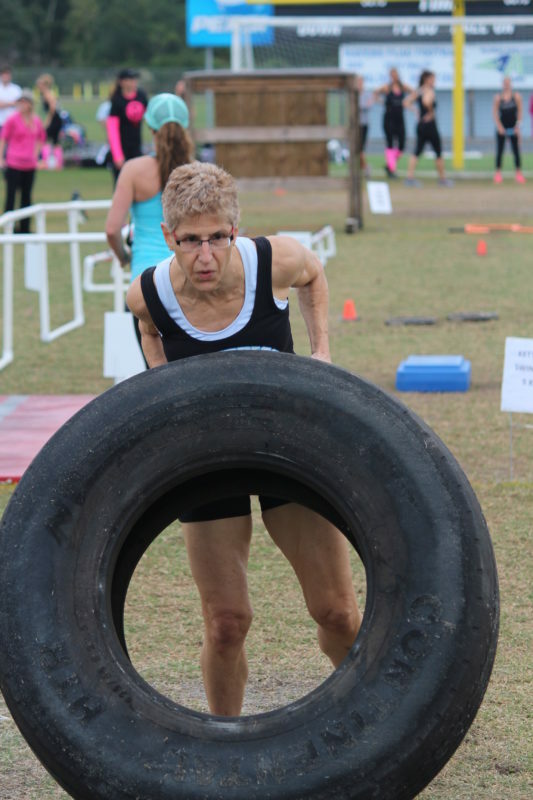 Strong Tri-Fitness Athletes challenge themselves on the True Grit event! The True Grit is a 230 yard challenge which tests the athletes speed, strength, agility and endurance. It consists of the following elements: 20 yard shuttle run, 5 ½ foot wall, running grid, 3 pushups (chest touching medicine ball), 15 foot bear crawl through a shoot, forward roll, cone weave, tire flip, 5 kettle bell swings (25 lb for women & 35 lbs for men), 10 straddle jacks, 3 squats and 20 yard farmers carry (2 – 35 lb weights for women & 2 – 45 lb weights for men), 10 heavy rope jumps (4 lb rope), 30 inch hurdle, 2 – 24 inch hurdles, under bar, and 40 yard sprint. This is an event where women can display their physique (a by-product of their training and nutrition). The judges are predominantly women with fitness/modeling backgrounds. The scoring criteria is the following: 1) symmetry; 2) feminine firmness; 3) grace & poise (presentation of physique/model walk); 4) overall appearance. Each of the categories above will be scored between 1.0 and 2.5 points then added up. This event is a choreographed routine (maximum of 2 minutes and athletes’s own music) where an athlete demonstrates strength holds, flexibility moves, and any combination of dance which is choreographed to their own music. It is scored with the following criteria: 1) strength; 2) flexibility; 3) choreography; 4) execution; 5) overall enthusiasm/appearance. Each of the categories above are scored between 1.0 and 2.0 points then added up.